iPhone X vs iPhone 8, one of the mind-boggling new features added to iPhone X is facial recognition, though it is said that Apple copies it from Samsung. Face ID on iPhone X can be used for much easier iPhone unblock, Apple pay, iTunes & App store, Safari Autofill and third-party 64 bit applications. Here's how to set up face ID on iPhone X, together with most common iPhone X Face ID setup questions and answers, and fixes to Face ID not working on iPhone X. Free download the must-have file manager for iPhone X, MacX MediaTrans. 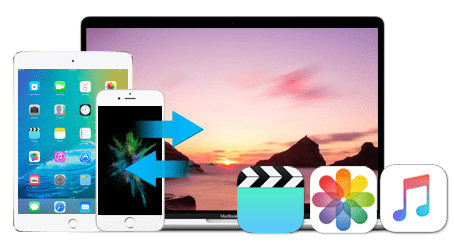 It helps transfer, backup and manage files covering photos, music, videos, ringtones, iTunes purchases, DRM contents, documents etc. and make ringtones, remove DRM, convert files, delete/organize songs, photos and more. Steps for Face ID setting up running iOS 11 are similar to that of Touch ID. Follow the guide below to set up and use Face ID feature on iPhone X. Meantime, you can turn on or turn off your passcode. Step 1: On your iPhone X, tap Settings to open the settings menu. Step 2: Tap Face ID & Passcode. You can use Face ID for iPhone Unblock, iBooks Store, iTunes & App Store, authenticate purchases, Apply Pay, signing in to certain apps and autofill passwords in Safari. Step 3: Tap Set Up Face ID to start to position your face within the frame on iPhone X. Step 4: Follow instructions to gently move your head to complete the circle on the screen. It is the most interesting part. Step 5: After the Face ID scanning process is finished, tap Continue to complete the circle again and get the Face ID setup process done in iPhone X. Finally, tap Done. Now, you can enjoy one of the biggest iPhone X pros. iPhone 8 doesn't support Face ID, also check iPhone 8 pros and cons. * What can Face ID on iPhone X be used for? Face ID on iPhone X can be used for iPhone unblock, payments including Apple Pay, 3rd-party apps, iTunes&App store and Safari Autofill. * Can I add multiple faces to Face ID? Yes, you can. 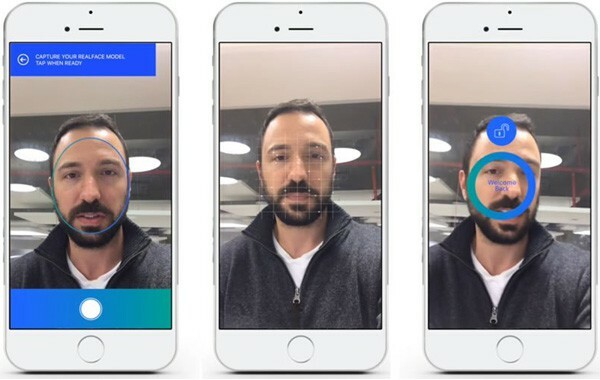 Face recognition feature on iPhone X supports multiple faces like Touch ID. * Will face recognition work in the dark? Yes, facial recognition can definitely work in the dark. If it doesn't work, check our solutions to Face ID not working on iPhone X below. 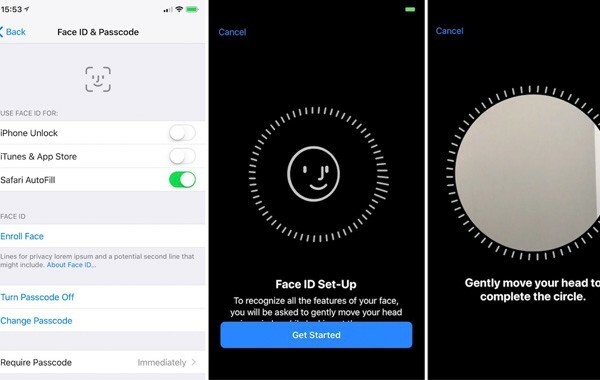 Before learning how to set up Face ID on iPhone X, some fans are wondering if someone else can use their iPhone X to scan their faces when sleeping to unblock iPhone. Some doubt that bank won't allow Face ID for payments because of security issues. In fact, others can also unblock your iPhone using your fingertips when you are sleeping. Face ID is faster and more secure than Touch ID. The face recognition feature will help auto lock the iPhone X if it detects an unregistered face, which is very useful when it comes to password and banking apps. So, feel confident about face recognition from Apple. If you want to reset up Face ID on iPhone X with other's face or you want to reset it to fix Face ID not working issue on iPhone X, use steps below. It's quite easy to reset Face ID. Step 1: Go to Settings > Face ID & Passcode on iPhone X. Step 2: Enter your passcode if asked. Step 3: Tap Reset Face ID and follow steps to reset Face ID on iPhone X.
iPhone X vs Samsung Galaxy S8 in Face Recognition, iPhone is even worse? Apple includes face recognition on iPhone X for the first time, however, the technology is nothing new, Samsung Galaxy S8 already embraced this feature. Did Apple steal face recognition from Samsung? iPhone X vs Galaxy S8 in facial recognition, which is better? This is what really matters. Samsung Galaxy S8's face recognition system can be easily fooled. Users are able to unblock the phone using a selfie. The security issues and not working errors are big problems existing on Galaxy S8's face recognition. Face recognition on iPhone X would be much better in security and performance, and iPhone is better than Android. Go to set up Face ID on iPhone X once you get the device! Also know more about iPhone 8 vs Samsung Galaxy S8, what should you choose? Face ID is one of the most stunning features coming from iPhone 8/iPhone X, it can be very frustrating if Face ID (setup) not working on iPhone X. Many users are running into face detection errors, face recognition not working issues, some of which appear after downloading a new update. Try these quick fixes to Face ID not working on iPhone X. Comment below if you have problems after your Face ID set up. Check more iPhone 8 problems and solutions. * Restart your iPhone X and try face recognition again. * Try different face positions to check if it works. * Update your apps on iPhone X if any update is available. * Clear caches and data on your iPhone X and try again. * Delete Face ID and set up Face ID on iPhone X again. * Your Face ID won't work properly if it detects an unregistered face. * Adjust your iPhone brightness if you use Face ID in the dark. * Reset all the settings and data on your iPhone. * Restore your iPhone, but remember to backup iPhone before doing so.